Hugo is an extremely affectionate horse whose playfulness and youthful spirit brighten the room. Dressage riding is an extremely difficult discipline of the equestrian arts. Often described as, “the highest expression of horse-training,” dressage involves the development of obedience, flexibility and balance. Jugueton is a 10-year-old Spanish Purebred horse who is trained in both Dressage and Liberty. Believe us when we say that this beauty is as noble as his heritage! 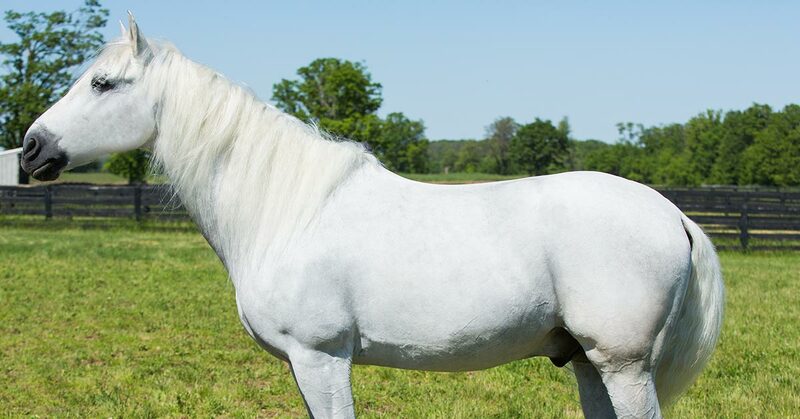 One of the oldest breeds of horses around today, they are known for their intelligence, their high capacity for learning and, not surprisingly, for their ability to excel at Dressage. Although Jugueton or “Hugo,” as he is often called, is a new addition to the Cavalia team, he fits right in with the rest of the performers (4-legged and otherwise). As is characteristic of his breed, he is a quick learner and after only several months of training, he is ready for the spotlight. Hugo is currently strutting his stuff in the act “The Herd,” while touring North America with Odysseo by Cavalia. His striking white coat shines bright while he runs and performs on stage with the rest of the troop. He really is a sight to behold. Haunting music sets the mood for Hugo’s big number as the curtains open to reveal a secret forest clearing. He wanders onto the empty stage full of mystery, followed shortly by the other horses, all interacting with one another and playing. Then humans start to arrive, as if they’re meeting the horses for the first time, mingling amongst themselves, becoming more familiar with one another and gaining each other’s trust. After the introductions are made, the music tempo picks up and the forest gathering turns into a celebration as the horses and humans both run around and play on stage until their heart’s content! This act is intended to show the unique bond of a herd and ends in a joyful harmony between human and horses. One of the things that fellow artists remark most about this beautiful purebred is his curiosity: he loves exploring his environment and has been known to be very silly when playing with trainers and groomers. Like humans, horses have complex personalities too. Some are more introverted and shy, while others are much more outgoing and like to make their presence known. Depending on their demeanour, different styles of training can be much more effective than others. What’s more, really listening to a horse’s needs increases their happiness and quality of life, which is top priority at Cavalia. According to his rider, Mathieu, and his groomer, Anne, this shy, curious horse requires patience and soft handling to thrive. In his down time Hugo likes to spend time horsin’ around with his friend and fellow performer Huracan. Come see both of these beautiful horses at Cavalia’s Odysseo and meet them in person during our VIP stables visit!